Ashlee’s dream job was being in IT, consulting to big business, and now she is doing just that. Ashlee Jensen is an IT Analyst at Deloitte Australia, consulting to big business and driving change in IT. It’s a graduate position she stepped into straight out of university. She studied a Bachelor of Information and Communication Technology (ICT) which she selected because she knew IT was everywhere, and she thought she could get a career out of it. She was right. I went over to the Melbourne Deloitte office to do an internship, while I was still at uni. As I was graduating, they called me up and asked if I would like to come and join a graduate position – and here I am! Ashlee works in Deloitte’s consulting area for a particular stream called Technology Advisory. I do strategy for big businesses and their enterprise architecture. Every day and every project is so different in consulting. That is what is so amazing about this job. “I meet new people all the time, and we’re working with the people who are going to drive change. It’s about how we can drive IT to be different, and also find different ways to use IT. It’s not what’s already there, it’s what can we think of that’s new and awesome that our clients can build and use. Ashlee is particularly fascinated by big data – the Internet of Things. “I love the idea that you can have a fridge that tells you when you need milk. Our clients want to harness that type of technology – and we can help them. It’s so exciting. 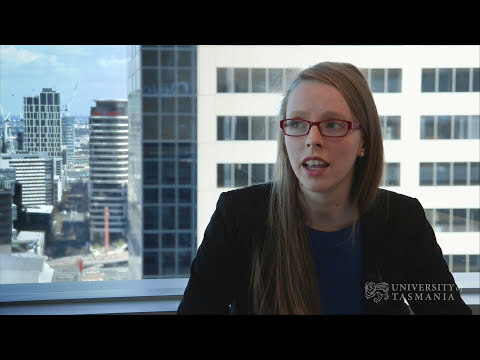 Ashlee says that the opportunities presented by studying at UTAS, because of the small class sizes, focus on problem solving and real world business experience, were instrumental in her success. I loved studying at UTAS – all the lecturers were amazing. Because of the smaller student cohort, I could walk into anyone’s office and get an hour, and they loved it. They loved that I had questions. It was the best. “The access to equipment was also amazing. I took networking in second and third year, and I could go into a lab and access all the IT equipment I needed to help me learn any time I wanted. If you were studying at a bigger university, you could not get that kind of access. The degree also provides a full year real world project for an industry client. Ashlee says it is the highlight of the degree. Businesses come to UTAS with something they need developed or a problem they need fixed in the IT space. We come together as teams of about six depending on how big the project is, and we do what you would do as a job, what I do now, for that company. “At the end of the year, we deliver the solution to the company. My project has actually been used, which was very exciting." “One of the key things that you learn in your degree is how to solve problems and how to approach problems. “Start early, be on it and know what you want." Ashlee did the Deloitte development program in first year. Through that she got the internship, which led to her securing her perfect role. She also worked in the local IT industry throughout her degree. "While I was at UTAS, there were heaps of emails going around about jobs in IT in Tasmania and encouraging you to apply for them. So I got a job in IT, while I was studying, thanks to UTAS. And that really helped me get the job at Deloitte. "There was a lot of competition, rooms of heaps of people applying for these jobs. So the opportunities you take on, to make yourself stand out, are important." “I work at the client offices, but there are commitments at the Deloitte office also." 9am: Organise some meetings in the city (Melbourne CBD). 10am: Do some work in a cab on the way back to her apartment to pick up her car. 10.30am: Drive to her client’s offices. 11am: Client meetings, work on the clients' project. 3pm: Coffee meeting with the client. 6.30pm: Go to the gym. Apply now to study a Bachelor of Information and Communication Technology at the University of Tasmania. Apply now to study Computing and IT. Around the world, employers are looking for professionals with knowledge and skills in this area. They need people who are capable of understanding and improving organisational processes through the use of Computing and IT.